You are hereMother Jones: Inside Groundswell: Read the Memos of the New Right-Wing Strategy Group Planning a "30 Front War"
Mother Jones: Inside Groundswell: Read the Memos of the New Right-Wing Strategy Group Planning a "30 Front War"
July 25, 2013- Believing they are losing the messaging war with progressives, a group of prominent conservatives in Washington—including the wife of Supreme Court Justice Clarence Thomas and journalists from Breitbart News and the Washington Examiner—has been meeting privately since early this year to concoct talking points, coordinate messaging, and hatch plans for "a 30 front war seeking to fundamentally transform the nation," according to documents obtained by Mother Jones. 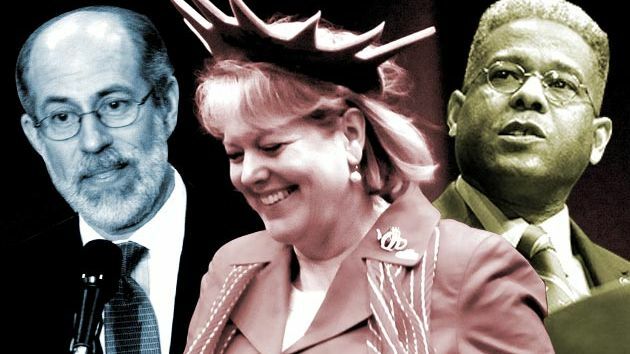 One of the influential conservatives guiding the group is Virginia "Ginni" Thomas, a columnist for the Daily Caller and a tea party consultant and lobbyist. Other Groundswell members include John Bolton, the former UN ambassador; Frank Gaffney, the president of the Center for Security Policy; Ken Blackwell and Jerry Boykin of the Family Research Council; Tom Fitton, the president of Judicial Watch; Gayle Trotter, a fellow at the Independent Women's Forum; Catherine Engelbrecht and Anita MonCrief of True the Vote; Allen West, the former GOP House member; Sue Myrick, also a former House GOPer; Diana Banister of the influential Shirley and Banister PR firm; and Max Pappas, a top aide to Sen. Ted Cruz (R-Texas).